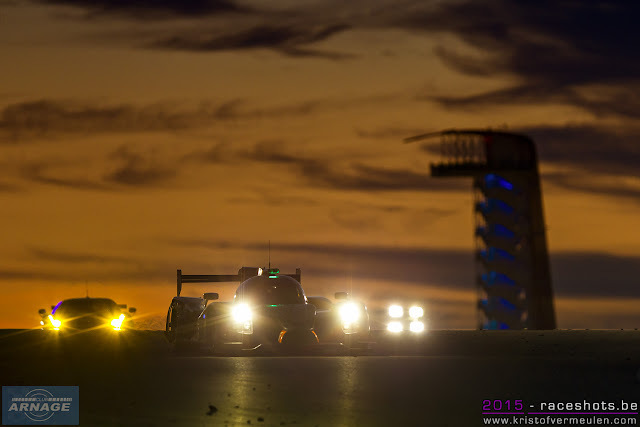 Porsche dominated the Lone Star Le Mans weekend at COTA, taking the win in the LMP1 and LM GTE-pro categories at the 6 hours of the Americas. Mark Webber, out for revenge after losing pole position at the very end of the qualifying session, took the lead at turn 1, passing Neel Jani. Behind them, Sebastien Buemi in the #1 Toyota split both Audis giving the Porsches the chance to cruise away from the competition. When Andre Lotterer took 4th place back from Buemi, it seemed like the LMP1 race was slowly settling itself. Halfway the race, Mike Conway started to struggle with traffic in his Toyota. 2.5 hours into the race he had a spin at turn 10 trying to pass the #88 Porsche and #96 Ferrari, half an hour later he crashed the Toyota coming out of turn 11, causing the second (and last) full course yellow of the race. 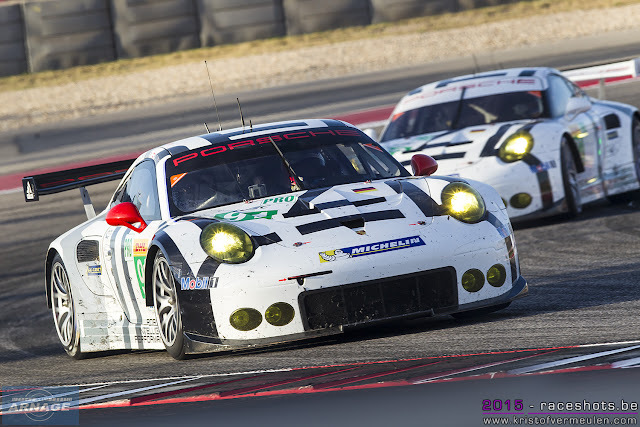 Both Porsches continued to control the race with the #17 still ahead. Right before the 4 hour mark however, the leading Porsche #17 got a 60 second stop and go penalty after a pit infringement, giving the lead to the sister car. When Mark Webber overshot his pit a bit later, it seemed like all hope for a second consecutive win was gone. With a bit more than half an hour to go, the race leading #18 Porsche 919 Hybrid suddenly came into the pitlane with an electrical issue, only to come back out to complete the final lap of the race. Brendon Hartley took the lead again, comfortably bringing the car home in front of both Audi's; the #7 car second and #8 third. The latter losing its hard fought second place also after a 1 minute stop and go penalty. ByKolles was the first LMP1 privateer ahead of both Rebellions who (again) suffered with several electrical gremlins during the race. As usual, LMP2 saw several hard fought battles, with G-Drive racing clinching the win after 6 hours in their #26 Ligier-Nissan. With the KCMG Oreca 05 starting at the back of the field, it was obvious they were going to play catch-up to get to the front of the field. It took Richard Bradley just over an hour to take the lead from the #26, getting into a battle that would last for most of the race. In between pitstop strategy from the leading prototypes, the #36 Signatech Alpine and the #30 ESM Ligier both shortly took the lead in the race. Near the half way point, Ed Brown lost his brakes on the #31 Extreme Speeds Motorsports Ligier-Nissan at the entry of turn 20, causing him to fly over the curb and crash hard into the safety barriers. Luckily for Brown the car didn't turn over, and he could walk away unharmed. Behind the KCMG and both G-Drive cars, the #30 ESM, #36 Alpine and #43 Morgan got into a frantic battle for fourth place, finishing in within less than a second after 6 hours. In the end it was G-Drive Racing that took the upper hand, winning the race with the #26 Ligier-Nissan, ahead of the #47 KCMG and the #28 G-Drive. The Aston Martins took a strong start in GTE-Pro but, struggling with the heat, their pace quickly faded away. Both Porsche Team Manthey 911's didn't seem to suffer from the heat, and dominated the 6 hour race, running without any problems. Early in the race the #92 of Patrick Pilet and Fred Makowiecki took the lead, ahead of the #91 driven by Richard Lietz and Michael Christensen. Both cars ran for almost 6 hours in close formation, the win decided by the final series of pitstops when the #92 took over the #91. Behind the unbeatable Porsches, AF Corse's #51 Ferrari 458 Italia seems te be cursed since the Nürburgring. The early championship leaders ran into trouble for the second race in a row, only managing 7th at the finish. 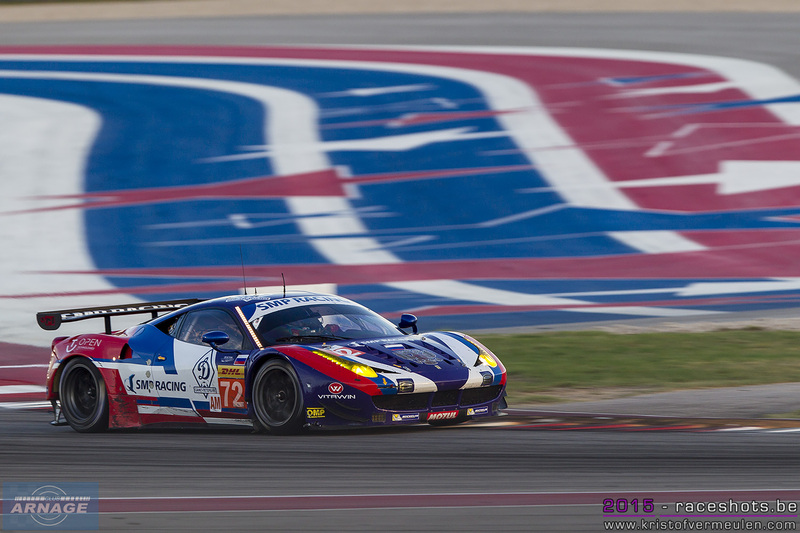 With the #51 in trouble and the Astons struggling for pace, the #71 took a fairly easy third place in Texas. GTE-AM saw more action, with both Proton Porsches and the Ferrari's of AF Corse and SMP Racing battling it out for the lead. Patrick Long in the #77 Dempsey Proton Porsche had a strong start from pole, mixing into the Pro cars before handing the car over to Patrick Dempsey. By the end of the second stint it was the #82 AF Corse Ferrari on top, until Le Mans winner Earl Bamber fought himself to the lead in the #88 Abu Dhabi Proton Porsche. Meanwhile the #50 Larbre Corvette fell back after a strong start, where as both Aston Martin never really were in contention for a podium finish. The current championship leaders, Victor Shaytar, Andrea Bertolini and Aleksey Basov came through in the fifth hour of the race, taking over the lead from the #88 Porsche and drove off to win their third consecutive win in class. Behind them, the #88 kept on to second place. The battle for third went on to the finish, with Marco Seefried in the #77 ultimately losing the final podium spot to the #83 Ferrari. A hard result for the Dempsey Proton Racing team after a succesful weekend with the first pole position in class and a very strong start of the race. 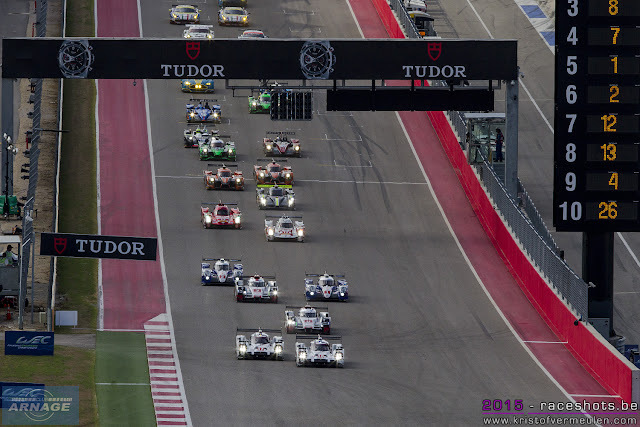 In the championship, the Porsche #17 crew closed the gap to the #7 Audi boys to 10 points. Audi has some work to do to close the gap again with Porsche, whose hybrid system is much more powerful at the moment. There's still 3 races to go in the 2015 championship, it surely seems like we're off for an exciting season finale !